Bamboo is one versatile material used around the garden. Whether used whole as a bamboo tube or split into bamboo strips, it's generally sturdy and lasts long. 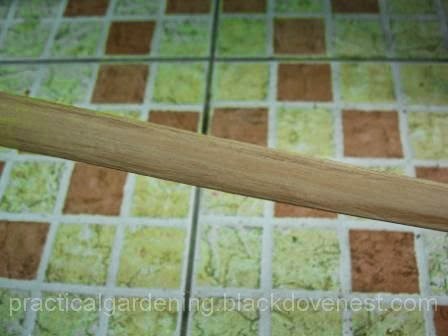 It's especially useful for staking plants as well as for creating trellises for vines. The simplest way to prolong the life of bamboo and make it attractive is to apply oil-based paints on its surface. An oil-based paint, such as the regular quick-dry enamel, dries to a tough shiny finish after drying. Two coats of this, one dried thoroughly after the other, goes a long way in terms of attractiveness and durability for your garden's use. Shown above is the top part of a garden trellis structure made of bamboo and painted white. I learned the long way though that applying paint on bamboo doesn't simply mean dipping the paintbrush and slathering away. No. Doing this will actually result in a glossy and smooth finish. But the paint will likely peel away after being exposed to the elements for a few years. 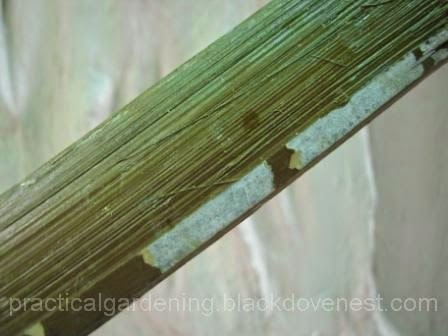 Shown below is a magnified portion of a bamboo strip that was painted years ago with a brown-colored quick-dry enamel. This is the exterior or smooth side of the bamboo. You'll notice that parts of the paint have peeled and flaked away already. Some portions were left with a very thin discolored (yellow) coating. Here's another part of the bamboo strip. But on this portion, you'll see the paint coat lifted entirely and peeled off. Now notice this other part. In this portion of the strip, the exterior was stripped off (smooth surface removed) accidentally. That's why you see fibers of the bamboo running its length. Then it was painted. Because of the rough surface, the paint has adhered well. By contrast, the part of the strip at the lower edge still has the smooth surface still intact. You'll notice the paint has peeled from the smooth surface. What this indicates is that the bamboo's exterior is too smooth for the paint to adhere adequately. After being continually exposed to the elements (sun and rain), the paint coat eventually peeled off. 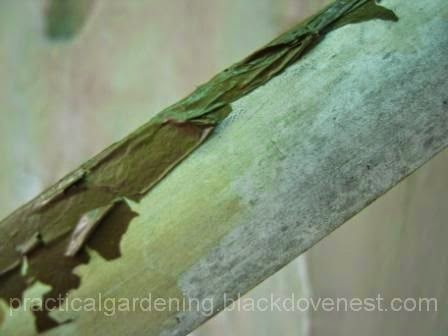 So to better prepare the bamboo for painting, roughen its surface with low-grit sandpaper. 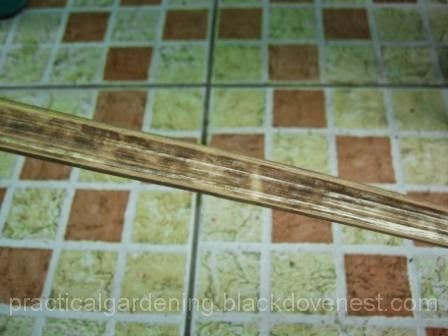 This is the exterior of a bamboo strip that has been scrubbed with sandpaper. The interior of bamboo has a white thin coating that can flake off. Try to remove as much as you can, first with a knife or machete and then with the sandpaper. This is the interior part at the other side of the strip that has been scrubbed. 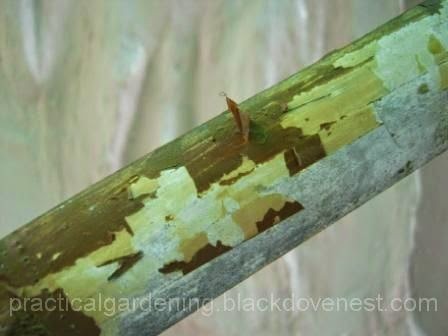 Notice this bamboo has been weathered by the elements and has discolored. Painting is fairly straightforward. Apply 2 coats of the oil-based paint on both exterior and interior parts. It is important to have the first coat dry thoroughly prior to applying the second coat. 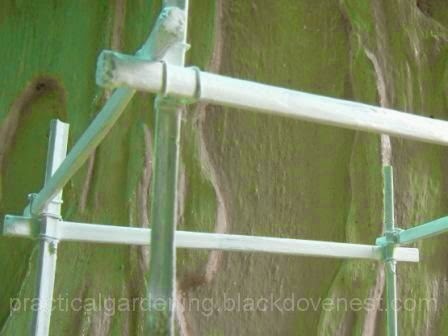 This will ensure a much tougher finish and will protect the bamboo longer in your garden.